The first thing that comes to mind when you think of pain is physical injury, or maybe emotional pain. But… have you ever considered your kitchen may be causing you pain? When homeowners are considering remodeling their kitchen, it is typically because something about their current kitchen “pains” them. 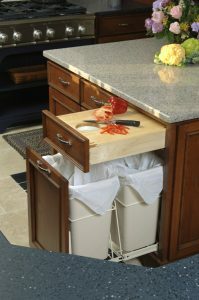 Organization: Everyone would like to improve accessibility to appliances throughout the kitchen. They also want ways to reduce the amount clutter on countertops. One solution is an organization station, which can be utilized in an end cabinet to incorporate a clever space for keys, a notice board for family and to-do lists, as well as stowaway slats for magazines and cookbooks. Clear off countertops and maximize corner-cabinet space by installing a two-tiered carousel, or lazy Susan. This helps you to keep both often-used and rarely used items tucked away but within easy reach. Having a paper towel drawer frees up some more counter space. The towels are easy to reach and out of sight. Try adding hinges and a convenient tray to the false drawer under your sink for an extra place to hide cleaning essentials. Kids love playing in the kitchen while you work, so look for clever options like toy drawers in your kitchen island, which can hold everything from crayons to puzzles. Cleanliness: Homeowners want products, surfaces, materials, and appliances that are easy to clean and maintain. When it comes to material, think smooth (no cracks, crevices, texture, or other places for dirt to accumulate), stain and water repellant, a pattern, earth tone in color (food colors), durable, and not glossy. The more of these features a material has, the easier it is to keep clean looking. Consider soft close doors and drawers. This allows you to close the door and drawer by just bumping it closed when your hands are dirty. When searching for a cooktop, look for removable controls, sealed burners, and black grates that can go in your dishwasher. Space: Having more room is always high on a wish list. Adding cabinets, pantries, and islands are typically how more space is achieved. 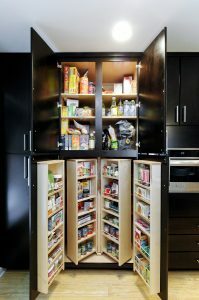 There also are many options for making the storage capacity within the cabinetry more efficient. Among the most popular are the drawers for pots and pans that roll out from the cabinet. Adding an island to your kitchen allows for more storage space, additional seating, and it’ll keep you in the middle of the action while you prepare meals. If the shelves in your pantry don’t hold enough items, consider getting new shelving installed. Shelves that are deeper or wider can accommodate more. 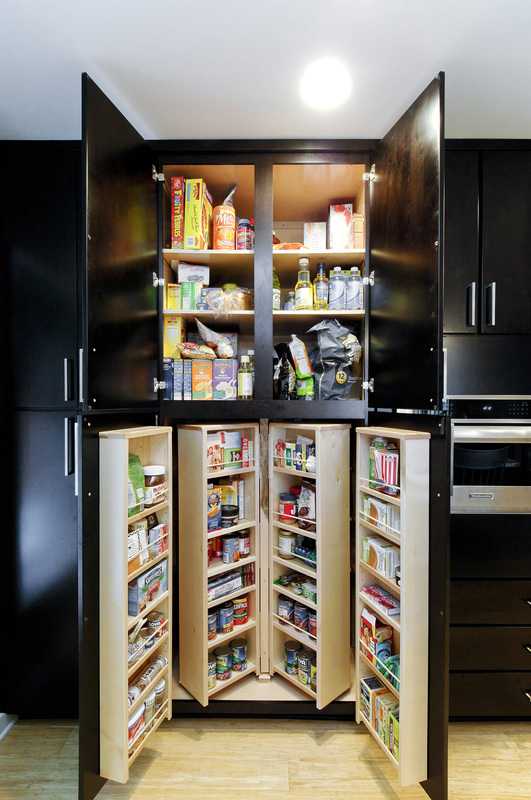 Instead of only using one type of shelving, vary the storage throughout the pantry. Pullout drawers and varying height shelves can give flexibility for housing small kitchen appliances and varying sized boxed goods. Product Design: Homeowners want improved products and features those products offer. Many appliances, materials, and products were originally installed to save costs and people want to upgrade. When you’re ready to upgrade appliances, you may want to take advantage of new or improved ideas since the last time you bought. A sleek induction cooktop has no open flames and generates heat directly into compatible pots or pans, making it more efficient than gas. Digital temperature controls on your refrigerator will display the actual temperature and the temperature you set. Hot-surface warning lights are an important safety feature on electric ranges and cooktops because the surface can remain hot long after an element has been turned off. Noise: Too much noise from appliances and products in the kitchen are constant problems for homeowners. Designing your new kitchen with appliances covered in integrated doors that match your cabinetry is an easy and smart way to reduce noise. Your dishwasher will be just as functional, and blends in nicely when closed. Trash compactors and disposals should be installed with a perimeter strip-type gasket or with rubber spacers to isolate vibrations. Mount exhaust fans outside the house and secure the ductwork by boxing it in tightly with plywood. Use rubber mounts to install the fan to reduce noise generated from vibrations. Large, heavy appliances, such as refrigerators, transfer their vibrations to the supporting floor, creating additional noise. These vibrations can be isolated from the floor by placing pads of rubber underneath the appliance’s legs or corners. Soft close kitchen cabinets close gently and physically can’t be slammed. Are any of these points paining you? When you’re ready to discuss remodeling your kitchen to cure what pains you, please call us at 215-660-5635 for a free consultation.